I hope everyone had a wonderful Mother’s Day! Mother’s Day has always meant a day of pampering for my family as we indulge in a day of brunch, shopping, & facials. Since I’ve been at school, I haven’t really been able to take part in the festivities since it also falls right around finals. This year I was quite fortunate that my family was in town for the weekend. Making us of our limited time, we went to many great new spots around the city and also made use of the wonderful products I had at home to treat ourselves to a little skin indulgence right at home! 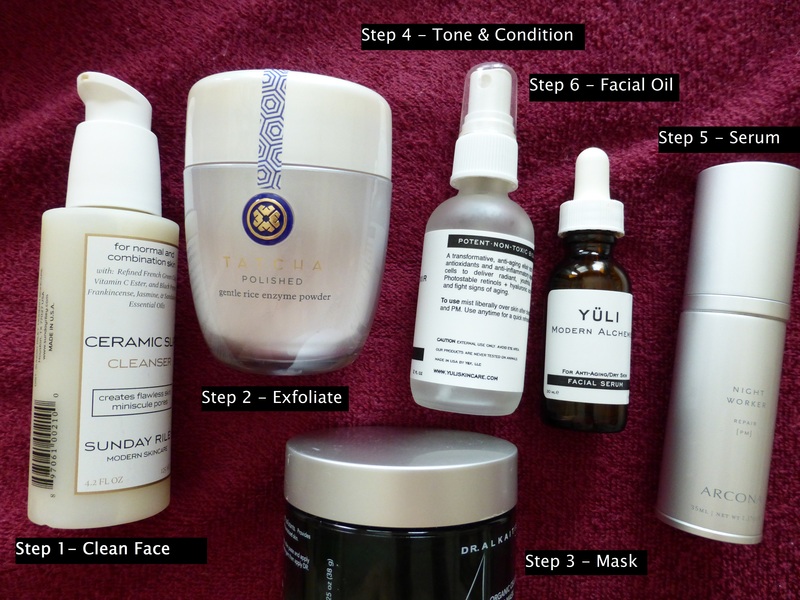 The routine begins with clearing the face of everything so we can really treat the skin. This is a two step process that begins with using a gentle clay based cleanser Sunday Riley’s Ceramic Slip which really takes off excess oils and impurities. Then I opened my new bottle of Tatcha’s Gentle Rice Enzyme Powder, a delightful powder that turns into a creamy mixture with a few drops of water right in the hands. This fragrance-free powder helps to exfoliate and get rid of buildup/dead skin in a wonderfully gentle way that does not make skin feel anything abrasive. Think of this as a lighter version of May Lindstrom’s Clean Dirt in that they’re both powder cleansers that foam with water, only this is much better suited for sensitive skin and is a much cleaner product to use (not in terms of ingredients but actual making and washing off). After this step, skin is completely clean and thanks to the gentle nature of the products – there is no feeling of tightness. Now we prepare the Dr.Alkaitis Organic Universal Mask. For my skin, I applied a few drops of water and some manuka honey into the mix for it’s acne fighting anti-bacterial properties. My mom used Royal Jelly which is much more suited for mature skin with its anti-aging collagen boosting properties and also used a few drops of the nourishing Modern Alchemist facial oil by Yuli to add another boost of anti-aging treatment. Once prepared, the mask looks so good – a very fresh green hue. We apply with an old makeup brush, a trick learned from May Lindstrom, to evenly spread the mask and wait 15-20 minutes for it to work its magic. Once the mask hardens, it is time to wash off. The honey delays the onset of tightness so it really helps the nutrients absorb into skin and I recommend using it for these powder masks. Upon washing off, my moms skin was smooth and soft and so was mine. It just looked so rested with redness gone and lines plumped. At this point skin is both fed but also open to receiving the treatments so I take advantage and liberally spray Yuli’s Metamorphic Elixir on my face and my moms to add in a boost of hydration and anti-aging actives. We gently pat that around our skin until it is fine and soft. While skin is still moist, we apply two pumps of Arcona’s Night Worker PM Repair serum that is loaded with Vitamin C to boost skin’s immunity and stimulate collagen synthesis during sleep. This serum smells like peaches due to pumpkin, peach, and apricot extracts which add an antioxidant kick. You’ll want to layer on a moisturizer over this although it is quite thick for a serum because the texture is a little sticky. The final step is massaging the nourishing Yuli Modern Alchemist facial oil with its bio-retinol complex and omega-lipid complex to lock in moisture and infuse skin with a dose of anti-aging nutrients. This has becomes my mom’s holy grail facial oil for its power to make her skin look more youthful and brighter, even I can feel that her skin has become smooth, soft, and plump. I don’t use this a lot for my blemish prone skin and mainly use it when my mom brings it with her but I love that I can use it sporadically to treat my skin when it really needs that extra replenishment and pampering especially around finals without worrying about breaking out. Follow this regimen with its rich skin nurturing actives and I promise that by the morning your skin will look like you just came from the most indulgent spa experience ever.